By FicFun Culture Media Co.,Ltd. Developer: FicFun Culture Media Co.,Ltd. Explore various genres of new stories written by worldwide authors. Read fresh, exciting and high-quality novels on FicFun. All genres including: romance, mystery & suspense, teen-fiction, fantasy, sci-fi, action, adventure, fan-fiction, historical fiction, horror, YA and humor stories are prepared for your selection! Reading Original stories with a simple, user friendly reader. Explore captivating episodes every day! Discover Stories A well-designed fiction market is developed for you to discover all sorts of stories. Following Stories Tap “follow” on the story page and read the fiction anytime in your following list. A simple click to download FicFun now and start a fantastic reading journey! MEET US AT FOLLOWING FORUM AND JOIN OUR FICTION FAMILY! Facebook: https://www.facebook.com/FicFun-802871063214836/ Twitter: https://twitter.com/Ficfun Instagram: https://www.instagram.com/ficfunofficial/ HAVE FUN ON FICFUN Join our server at Discord https://discordapp.com/invite/Bt2CENd We welcome writers to show your talent to readers all around the world. You can create and display your works on our website at www.ficfun.com; If your story is of especially high quality, you will have the chance to become one of our signed writers and receive an attractive payment! About FicFun FicFun, Discover Stories Worth Reading! 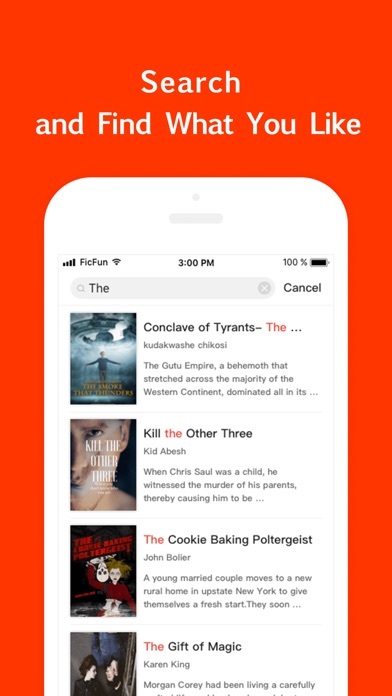 Being set up by a group of bookworms and literature enthusiasts, FicFun is an online library for people who love fiction reading and creating. No matter who you are and where you are, feel free to discover and share books you like with your friends. Join FicFun, have fun, and become our ficfan! Love this app. Engaging stories, easy use, user friendly, and so enjoyable. 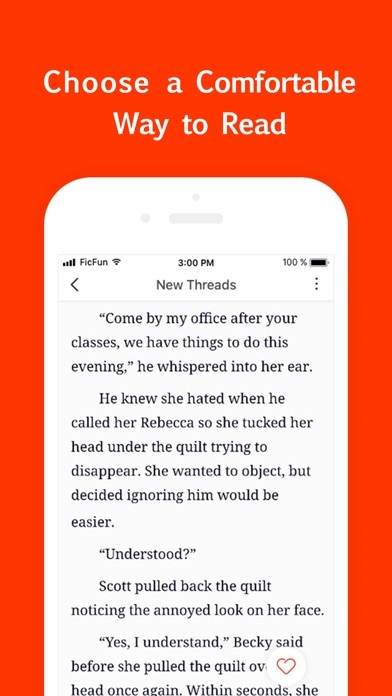 I very much love this app, great stories and a great way to support writers. But I just recently purchased coins and I was told it was a successful purchase yet I’ve waited for at least a day and my coins are no where to be seen. Tried to submit a feedback that was given from the app itself but it wasn’t able to be sent? I have rated it 4 stars instead of 5 because the only thing that i do not like is the fact that you cant wrote comments. Other than that the app is amazing, so many great books to choose from. I mean, what the heck? People want to be able to read these books but you have to use an awful coin system. Then you have to pay for coins. I mean what is that. It’s totally unfair and the worst part is I can’t delete the app because there’s some really good books on here. In all honesty if they wanted to make money they could have just used ads like every other app. It’s extremely disappointing and I recommend not getting the app so you won’t become hooked and resort to drastic measures for coins. More by FicFun Culture Media Co.,Ltd.